We are so excited to be hosting "Chef’s Cut," a unique dining experience in an intimate setting. Over the course of five evenings, our super talented Chefs will be hosting an impressive curated menu personally developed by the Star Chef of the night. This amazing culinary venture gives our guests the opportunity to meet the star Chefs of the Grand Cayman Marriott Beach House tableside as they lead you through their journey of inspiration. 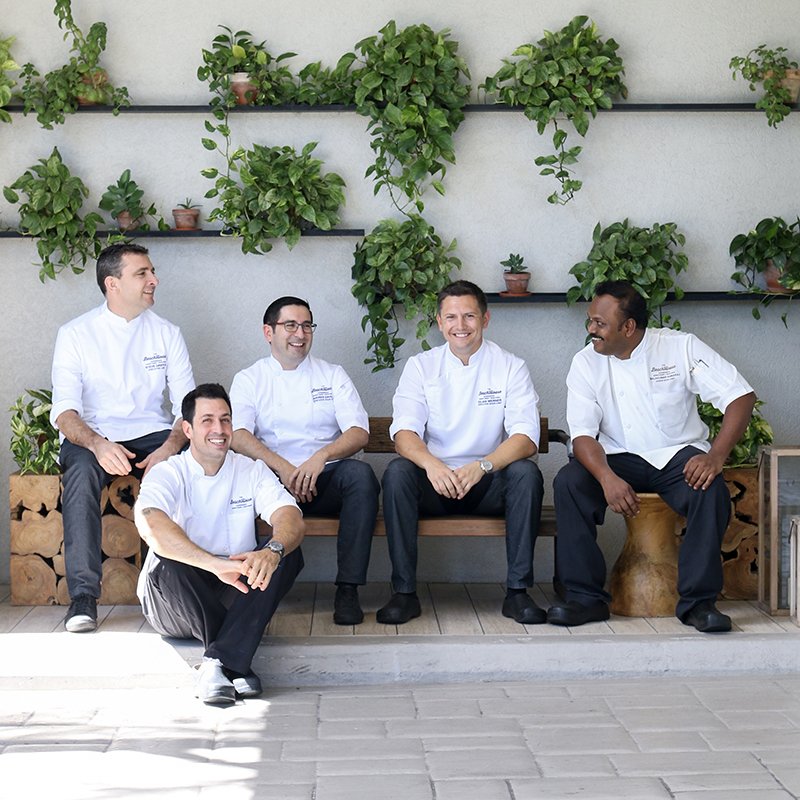 Our 5 chefs are preparing themselves for next week's events and we can’t wait to see what they have up their sleeves. Seats to this exclusive event are selling like hotcakes - read below to see what’s cooking on each night. For Chef Damian, no passion is a coincidence…his for the kitchen started 11 years ago. He has mostly worked in fine dining restaurants and well-known hotels brands in Argentina. He also worked at the Martín Berasategui restaurant (3 Michelin stars) in San Sebastian, Spain – a place that today is considered one of the most avant-garde in the gastronomic world. Chef Damian came to Cayman looking for a new challenge. What he will offer guests on the evening is a menu based on his best culinary memories growing up in Argentina. He will be bringing to the table dishes that define and mark his past as well as techniques from the contemporary culinary world. Chef Kilian’s menu is inspired by the culinary journey that he has been undergoing for the past 15 years. Originally from the south of Germany, he was influenced by his grandmother’s home-style cooking. Kilian started his career in Frankfurt, a multicultural city in the heart of Germany. After completing his apprenticeship working in a French Brasserie style restaurant, he decided to move to Manchester, England where he worked at a steakhouse for 3 years. His next move brought him to Dubai where he eventually became part of the opening team of the tallest hotel in the world, the JW Marriott Marquis Dubai. During his free time in Dubai, he mostly enjoyed trying out all the different restaurants from a variety of cultures in this buzzing culinary melting pot of a city. From Dubai, he then moved on to join the kitchen team in the US Virgin Islands at the iconic Frenchman’s Reef & Morning Star Beach Resort and lastly continued his Caribbean adventure in the Cayman Islands. For Chef’s Cut, Kilian’s menu is inspired by his nostalgic past and all the exciting culinary adventures he has had – from his childhood to his travels across the world. On the evening, Chef Kilian plans to share his passion and take guests on a journey to Germany, Dubai plus so much more. When Chef Balakumar was thinking about his menu for this evening, he recalled his culinary travel experiences back in India. He is thrilled to bring back these golden memories and share them with our guests. In India, they have 29 states and 9 union territories. In that, they have different language, cultures, food and religion, but the end part is, they are all Indian. This is the why Chef Balakumar wanted to showcase a menu with a focus of unity of diversity. He plans to bring the four regions of India to the table. He will be usingmain ingredients and cooking techniques that he cultivated back home. He will also be mixing his own spices with the best ingredients he can source. It will be a journey of diverse aromas and flavours! Executive Chef Steve grew up in a small coastal village near Nantes, France. His parents are farmers and his mother always cooked using produce from their farm, including many types of vegetables, poultry and eggs. Steve’s passion for cooking is rooted in his childhood when we would make desserts with his mother, using only fresh products from their farm. He knew he wanted to be a chef at the tender age of 10. He also loves to go fishing, a hobby that he continues to be passionate about today. His love for fishing and seafood have inspired many of his signature dishes. Throughout his career, his culinary vision grew to incorporate influences from his experiences in Europe and the Caribbean. For Chef’s Cut, Steve’s menu is inspired by his childhood in France. After 20 years in the hospitality industry working with a multicultural team, modern equipment and new sources of technologies, he would say that his culinary repertoire is from all over the world. However, he always keeps a special place in his heart for his mother and grandmother’s teachings. His cooking style has been influenced by these roots and he has evolved his cuisine to new trends. On the evening, Chef Steve plans to share his passion and take guests on a journey from the French countryside to the busy streets of Paris. Recognised as an important influencer in Ecuador’s traditional and contemporary gastronomic movements, Andres is preparing an inspirational menu of “Soul Food” with an Avant-Garde twist. When you’re talking about Latin cuisine, you’re referring to the similarity in culture of over 20 different countries, all of them with a language brotherhood. Diverse as all of the regions of the American continent, Latin cuisine is rich in products and techniques, which are coming from different time frames: pre-Hispanic, Colonial, Republican and Modern. Andres is going to transmit the immense passion that he has to share with those around him a never-ending zest for bringing alive that magical (and certainly delicious) alchemy that fuses some of the grandmas’ traditional and ancient-rooted recipes with new and imaginative touches, ingredients, textures and flavors; far beyond just decoration. Referring to New Latin cuisine, Andres defines it as “Author’s Cuisine” or “Signature Gastronomy,” which privileges a focus on colonial and pre-Hispanic traditional cooking, revitalized antique recipes, use of fresh and best-quality ingredients and a permanent evolution, adding to those dishes new textures, flavors, creative mixes and combinations all aimed to offer to the guests a unique culinary experience. As a modern Chef who uses today’s technologies at many levels and instances of his work, Andrés still roots his main principles in those practical and philosophical teachings of his beloved grandmothers, including the buying of fresh local ingredients from the market, fishermen, stores and suppliers. Available seating times are 7 pm or 8.30pm.